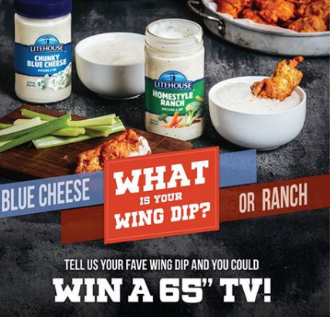 Litehouse “Bring on the Heat” Sweepstakes – Win a 65″ TV! ENTER SWEEPSTAKES HERE – Litehouse Facebook page. ELIGIBILITY – The Promotion is open only to legal residents of the United States, the District of Columbia, (excluding Puerto Rico and any other U.S. territories) and Canada (excluding Quebec) who are 13 years of age or older and have reached 13 years of age in their state as of November 13, 2017. SWEEPSTAKES ENTRY PERIOD – The Promotion begins at 05:00:01 Pacific Time (“PT”) on January 19, 2018 and ends at 23:59:59 PT on February 5, 2018. PRIZES – One Grand Prize: a 65″ TV. Problem: After completing entry form there is an error message ‘You must log in to continue.’ Rules do not state that Facebook is a requirement of the entry process. Site says: This promotion is managed by Litehouse Inc. This promotion is in no way sponsored, endorsed or administered by, or associated with, Facebook. You are providing your information to Litehouse Inc and not to Facebook. By participating in this promotion you agree to a complete release of Facebook from any claims. Participation in this promotion is subject to the official rules. Diane – this is a Facebook sweepstakes as stated on this post. I haven’t had any problems with entering.